Our professional design staff can assist you in choosing the correct mezzanine flooring for your needs. The following decks are our standard items; please call us at 1-800-325-3781 for other decking options. Consists of one layer of 3/4" T&G, OSB (oriented strand board) installed over 1-1/2" deep gauge corrugated steel deck. OSB provides good resistance to foot traffic and can handle random wheel loads up to 300 lbs. The steel decking has a white underside to provide maximum light reflectance. Most economical selection for general storage and office applications. 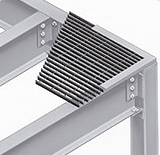 Bar Grating – 1" x 1/8"
A strong and economical alternative, bar grating allows for air movement, light, and water from overhead sprinklers to pass through deck surface. Nominal 1" x 4" opening. Black finish is standard. Also available in a galvanized finish. Should not be used for pallet jack applications. 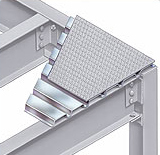 Heavy-duty steel tread plate has a diamond embossed non-skid surface. OSB is 3/4" tongue and groove over a 20 gauge corrugated steel deck. Provides greater durability with higher point load and wheel load capacities. Mezzanine flooring designed for projects that will not allow combustible materials, 12 gauge steel tread is provided directly over the steel roof deck. Steel tread plate is diamond-embossed for a non-skid surface. 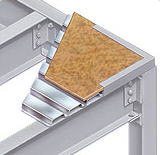 Top surface of tread plate can be shipped unfinished or painted. White underside of decking for light reflectance. Recommended for mezzanines requiring a solid floor subject to heavy loads from the use of pallet jacks, carts or dollies. Flooring has an acryseal skid-resistant, cleanable surface. Standard gray finish. Clear finish available at additional cost. 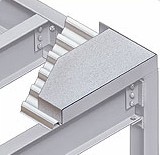 The strongest and most durable mezzanine surface available. Ideal when high point loading and capacity is required. Density minimizes transmission of noise through decking. 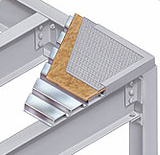 Steel decking is provided with components needed to accept pour of 4-inch concrete floor. Custom colors are available. Consult factory for details.